The 10-year Treasury was as low as 2.33 percent late last week. But it opened at 2.44 percent early Monday morning. Meanwhile, the 2-year opened at 2.29 percent, and the 30-year opened at 2.84 percent. Last week, rates continued to drop across the curve, but they bounced later in the week and opened higher than last Thursday’s lows. The curve is approaching inversion, with short rates essentially pinned at the federal funds level. 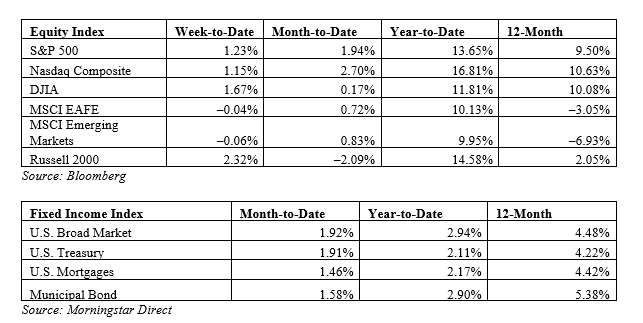 The three major U.S. markets were all up last week as they continued to process both the dovish tone from the Federal Reserve (Fed) and positive updates on U.S.-China trade relations. Following the Fed’s more dovish commentary and plans to end the balance sheet runoff in September, investors turned to a risk-on approach. The top three performing sectors were industrials, materials, and consumer discretionary. Those sectors that were among the worst performers were utilities, communication services, and energy. S. Treasury Secretary Steven Mnuchin traveled to Beijing to meet with China’s Vice Premier Liu He. Mnuchin stated that the task was constructive, and Bloomberg reported that part of the focus of the meeting was to ensure that the deal text had no discrepancies. Last week saw the release of a number of important economic data releases. On Tuesday, February’s housing starts came in much worse than expected, with a monthly drop of 8.7 percent against expectations for a decline of only 0.8 percent. Tuesday’s Conference Board Consumer Confidence Index also disappointed, with a decline from 131.4 to 124.1. Consumer confidence was expected to show a modest increase, so this pullback is worth monitoring. On Thursday, the third and final read of fourth-quarter gross domestic product growth was released. The economy grew at an annualized 2.2-percent rate. This result was down from the 3.4-percent rate in the third quarter. Finally, on Friday, we saw the release of February’s personal income report and January’s personal spending report. Income rose by 0.2 percent, while spending grew by 0.1 percent. While this growth is modest in absolute terms, both measures had declined in the preceding months, so any growth is welcome. This week is a busy one for economic data and should provide further insight on whether the recent spate of weak data is likely to continue. On Monday, the retail sales report is expected to show faster growth at the headline level. It should rise from a gain of 0.2 percent in January to a 0.3-percent gain for February, boosted by higher gas prices. Core retail sales, which exclude autos, are expected to slow substantially, from a 0.9-percent gain to a 0.4-percent gain. Overall, while sales continue to grow, the growth rate has weakened after a significant pullback in December and will likely signal slower first-quarter growth. Also on Monday, the Institute for Supply Management (ISM) Manufacturing index is expected to rise slightly, from 54.2 in February to 54.3 for March. This figure would suggest that a slowdown in global demand has not yet significantly damaged the U.S. manufacturing sector. This is a diffusion index, where values above 50 indicate expansion and below 50 indicate contraction. So, this would be a reasonably healthy figure, suggesting continued growth. On Tuesday, the durable goods orders report is also expected to disappoint at the headline level. It should drop from a gain of 0.3 percent in January to a decline of 1.2 percent for February, on a significant drop in aircraft orders. That said, this is an extremely volatile series that depends largely on aircraft. The core index, which excludes transportation and is a better economic indicator, is expected to rise from a decline of 0.2 percent in January to a gain of 0.3 percent for February. There may be some downside risk here on a weakness in business investment plans. On Wednesday, the ISM Nonmanufacturing index is expected to pull back from 59.7 in February to 58 in March. This result would still leave it at a very healthy level on strong domestic demand for services. This is a diffusion index, where values above 50 indicate expansion and below 50 indicate contraction. As such, this would be a very healthy figure despite the recent pullback, suggesting continued growth. Finally, on Friday, the employment report is expected to show that job growth recovered to 175,000 for March, up from a surprise decline to 20,000 in February. There may be some downside risk here, which could indicate job growth is finally slowing. The unemployment rate is expected to hold steady at 3.8 percent. Wage growth is expected to pull back from 0.4 percent to 0.2 percent, although that would still leave annual growth steady at 3.4 percent. If the numbers come in as expected, it will provide more assurance that despite recent weakness, the economic fundamentals remain sound. Disclosures: Certain sections of this commentary contain forward-looking statements that are based on our reasonable expectations, estimates, projections, and assumptions. Forward-looking statements are not guarantees of future performance and involve certain risks and uncertainties, which are difficult to predict. All indices are unmanaged and are not available for direct investment by the public. Past performance is not indicative of future results. The S&P 500 is based on the average performance of the 500 industrial stocks monitored by Standard & Poor’s. The Nasdaq Composite Index measures the performance of all issues listed in the Nasdaq Stock Market, except for rights, warrants, units, and convertible debentures. The Dow Jones Industrial Average is computed by summing the prices of the stocks of 30 large companies and then dividing that total by an adjusted value, one which has been adjusted over the years to account for the effects of stock splits on the prices of the 30 companies. Dividends are reinvested to reflect the actual performance of the underlying securities. The MSCI EAFE Index is a float-adjusted market capitalization index designed to measure developed market equity performance, excluding the U.S. and Canada. The MSCI Emerging Markets Index is a market capitalization-weighted index composed of companies representative of the market structure of 26 emerging market countries in Europe, Latin America, and the Pacific Basin. The Russell 2000® Index measures the performance of the 2,000 smallest companies in the Russell 3000® Index. The Bloomberg Barclays US Aggregate Bond Index is an unmanaged market value-weighted performance benchmark for investment-grade fixed-rate debt issues, including government, corporate, asset-backed, and mortgage-backed securities with maturities of at least one year. The U.S. Treasury Index is based on the auctions of U.S. Treasury bills, or on the U.S. Treasury’s daily yield curve. The Bloomberg Barclays US Mortgage Backed Securities (MBS) Index is an unmanaged market value-weighted index of 15- and 30-year fixed-rate securities backed by mortgage pools of the Government National Mortgage Association (GNMA), Federal National Mortgage Association (Fannie Mae), and the Federal Home Loan Mortgage Corporation (FHLMC), and balloon mortgages with fixed-rate coupons. The Bloomberg Barclays US Municipal Index includes investment-grade, tax-exempt, and fixed-rate bonds with long-term maturities (greater than 2 years) selected from issues larger than $50 million. The Axial Company is a privately-held, independent financial services firm specializing in wealth management, corporate employee benefits, and insurance. Our integrated approach to serving the needs of our clients on a wide array of business and personal matters enables our clients to seamlessly interact with us across all divisions; Axial Financial Group LLC, Axial Benefits Group LLC, and Axial Insurance Group LLC. This communication is strictly intended for individuals residing in the states of AR, AZ, CA, CO, CT, DC, DE, FL, GA, IL, IN, KS, MA, MD, ME, MI, MN, MO, MS, MT, NC, NE, NH, NJ, NM, NV, NY, OH, OR, PA, RI, SC, TX, UT, VA, VT, WA, WI. No offers may be made or accepted from any resident outside these states due to various state regulations and registration requirements regarding investment products and services. Securities and advisory services offered through Commonwealth Financial Network, Member FINRA (www.finra.org) / SIPC (www.sipc.org), a Registered Investment Adviser. Fixed insurance products and services offered by Axial Benefits Group and AxialFoy Insurance are separate and unrelated to Commonwealth. The Axial "A" logo, PINCAP®, and PCMI® are registered trademarks of Axial Financial Network, LLC, and/or its affiliates. The marks "Centered on You"℠, AFG℠, ABG℠, AFP℠, Swift Financial Services℠, Axial Financial Group℠ LLC, Axial Benefits Group℠ LLC, Axial Financial Partners ℠ LLC, Axial Insurance Group℠ LLC, and the Axial Family of Companies℠ are proprietary Service Marks of Axial Financial Network, LLC. All rights reserved.